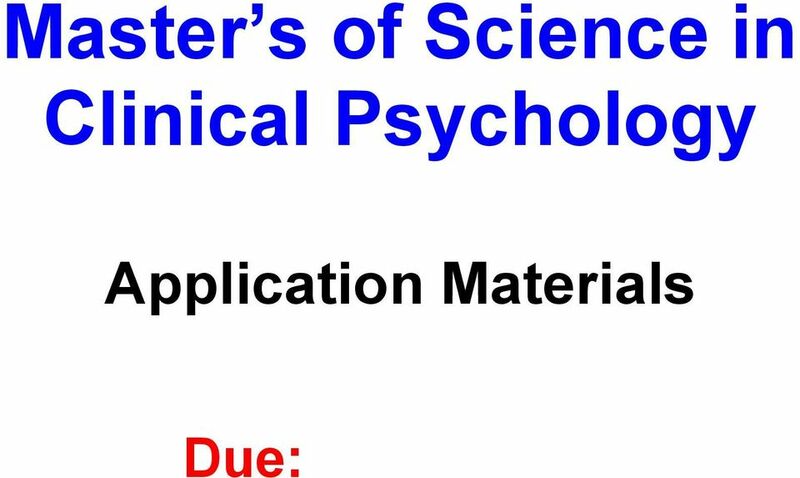 Download "Master s of Science in Clinical Psychology"
4 REQUIRED MATERIAL All MUST be included with application DEPARTMENTAL APPLICATION Complete the Departmental Application form that follows these instructions. Be sure to complete all sections and sign the bottom. 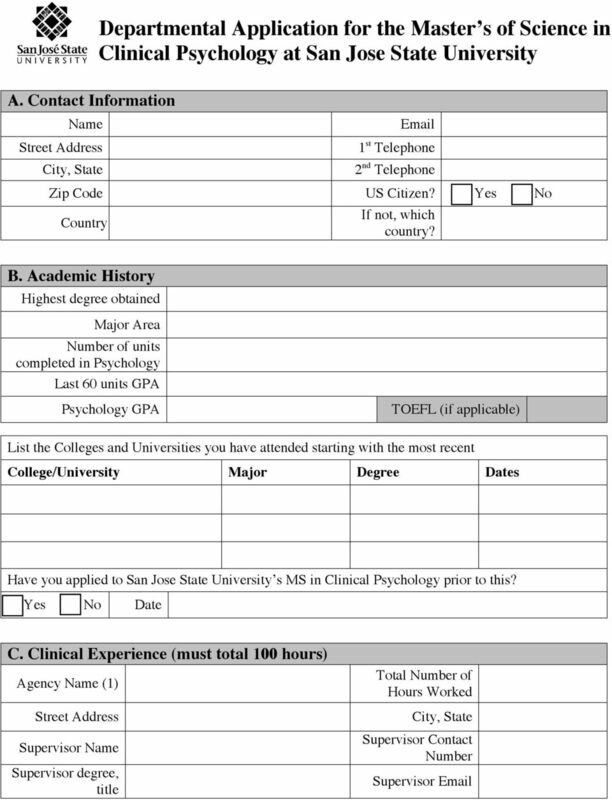 CALCULATE YOUR GPA A minimum GPA of 3.0 in all Psychology courses AND a 3.0 for the last two years (60 semester units or 90 quarter units) of undergraduate coursework is required for admission. 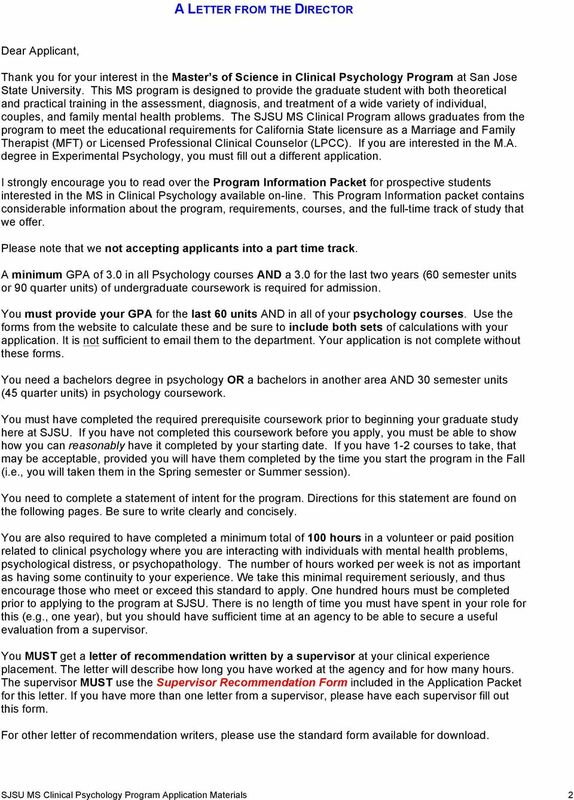 You must provide your GPA for the last 60 units AND in all of your psychology courses. Use the forms from the website to calculate these and be sure to include both sets of calculations with your application. 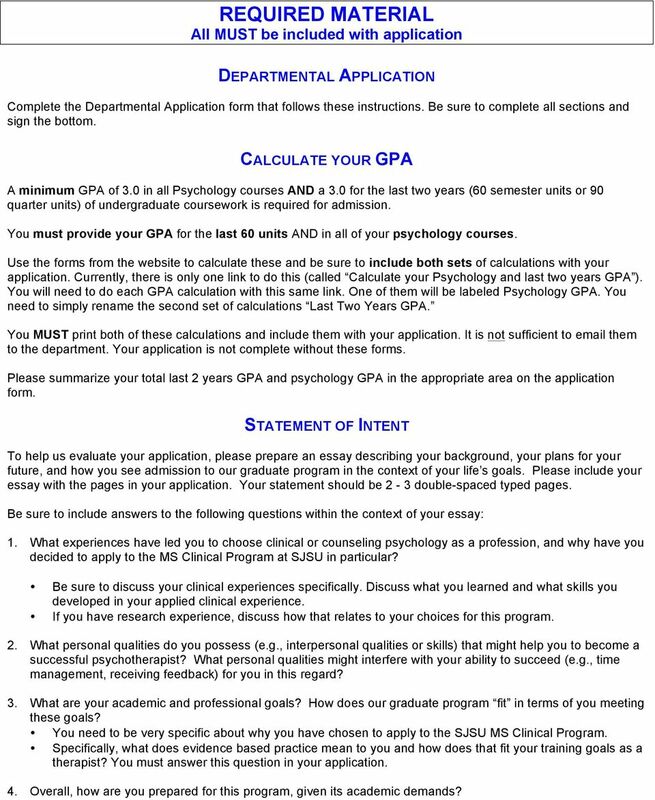 Currently, there is only one link to do this (called Calculate your Psychology and last two years GPA ). You will need to do each GPA calculation with this same link. One of them will be labeled Psychology GPA. You need to simply rename the second set of calculations Last Two Years GPA. You MUST print both of these calculations and include them with your application. It is not sufficient to them to the department. Your application is not complete without these forms. 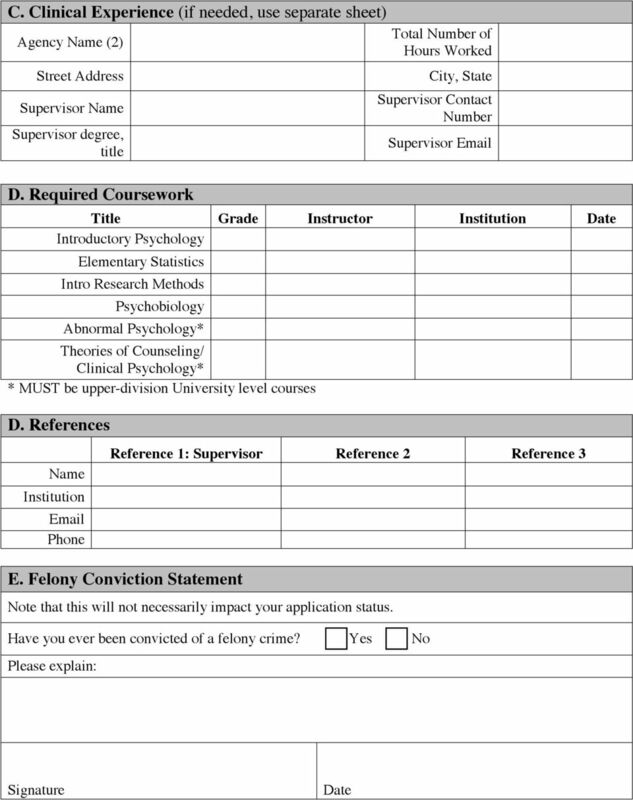 Please summarize your total last 2 years GPA and psychology GPA in the appropriate area on the application form. STATEMENT OF INTENT To help us evaluate your application, please prepare an essay describing your background, your plans for your future, and how you see admission to our graduate program in the context of your life s goals. Please include your essay with the pages in your application. Your statement should be 2-3 double-spaced typed pages. Be sure to include answers to the following questions within the context of your essay: 1. 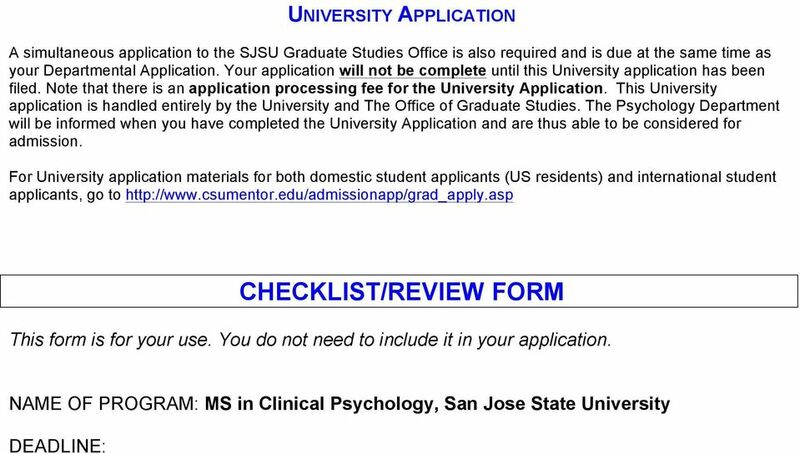 What experiences have led you to choose clinical or counseling psychology as a profession, and why have you decided to apply to the MS Clinical Program at SJSU in particular? Be sure to discuss your clinical experiences specifically. Discuss what you learned and what skills you developed in your applied clinical experience. If you have research experience, discuss how that relates to your choices for this program. 2. What personal qualities do you possess (e.g., interpersonal qualities or skills) that might help you to become a successful psychotherapist? What personal qualities might interfere with your ability to succeed (e.g., time management, receiving feedback) for you in this regard? 3. What are your academic and professional goals? How does our graduate program fit in terms of you meeting these goals? 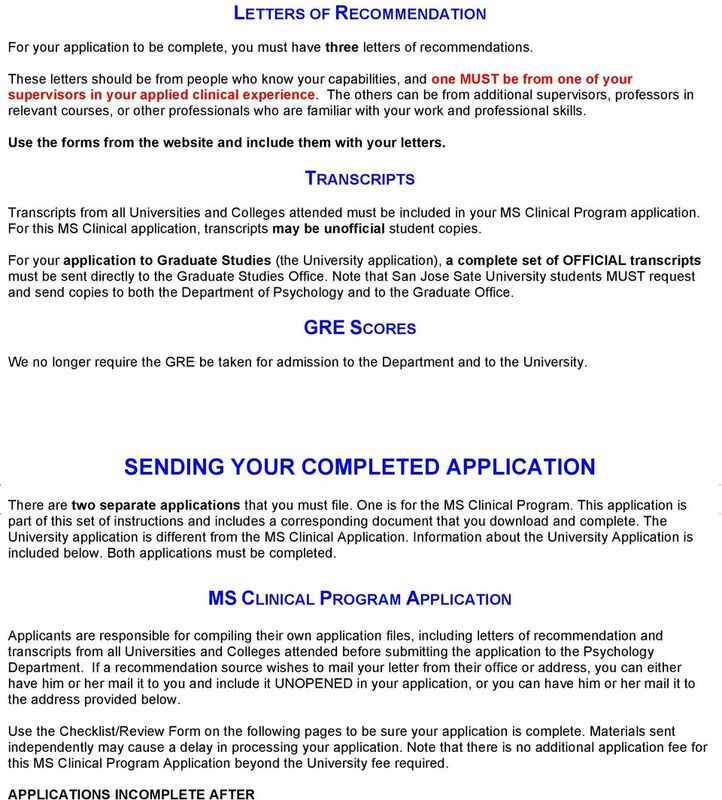 You need to be very specific about why you have chosen to apply to the SJSU MS Clinical Program. Specifically, what does evidence based practice mean to you and how does that fit your training goals as a therapist? You must answer this question in your application. 4. Overall, how are you prepared for this program, given its academic demands? Dear Applicant: We welcome your interest in our Master s Degree in Counseling, and please be assured that we read carefully all applications. We are interested in knowing who you are from your unique perspective. Agenda. I. 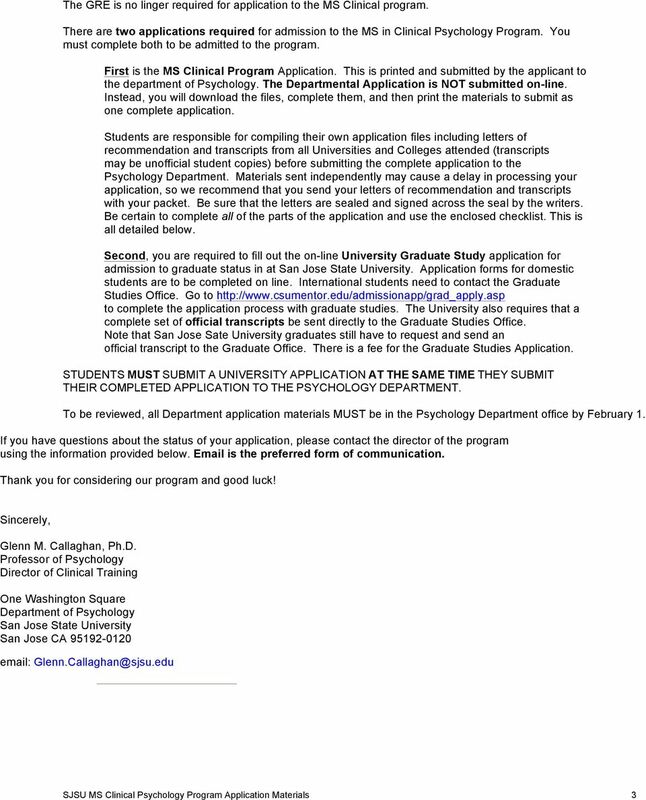 Application Process A. University B. Program C. Requirements D. Timeline E. Following Admission II. Student Counseling Society III. Welcome! Thank you for your interest in the Art & Art Education Program at Teachers College. 525 West 120th Street, New York, New York 10027 Telephone: 212-678-3360 E-mail: arted@tc.edc Dear Applicant, Welcome! Thank you for your interest in the Art & Art Education Program at Teachers College. Please read the Graduate Brochure before you complete the application below.